Turchin at home game against GBS on Dec. 4,. As Evanston trailed 19-13 at the end of the first quarter Friday night, it looked as though the underdog Hawks might upset the third-seeded Kits in the championship of the IHSA Regional tournament that Maine South hosted. But ETHS regrouped and showed why they have been mainstays in the Chicago area’s top 20 girls teams all season. 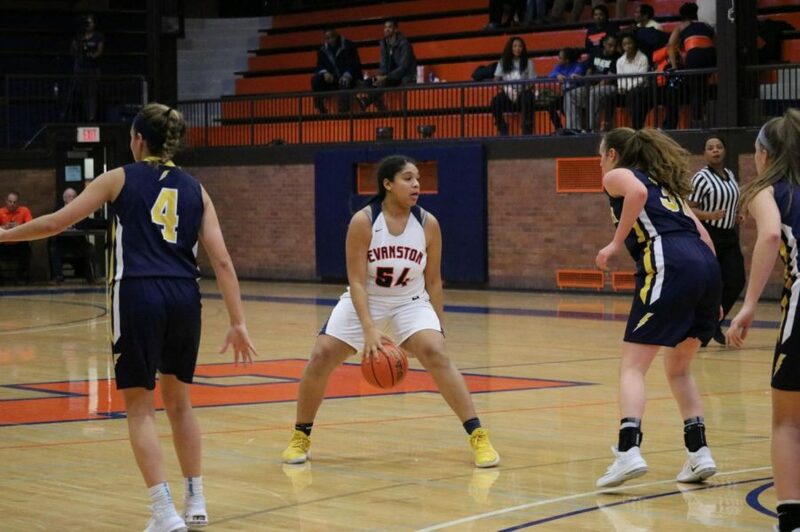 Evanston went on an 18-3 scoring run that included two three-pointers from senior guard Delaney Brooks and five points from senior forward Syann Homes. The onslaught spanned a little longer than a quarter of play and the Kits themselves with a 31-22 lead part-way through the third period. The Kits held the lead for the remainder of the game and although Maine South closed the gap to four on multiple occasions, ETHS pulled away in the final minutes for a 63-46 victory and their sixth regional championship in the last seven years. On the offensive side for Evanton, junior Jayla Turchin had arguably the best game of her career, scoring 26 points, adding 11 rebounds and dishing out six assists. Aside from Turchin, the rest of the Kits’ scoring was balanced as Brooks, Holmes and junior center Ambrea Gentle all scored eight points and junior guard Kayla Henning contributed seven. All four of those players have dealt with injuries this year and Johnson realizes how important it is that they are all healthy now. Next up for the ETHS, in the semifinal game of the Sectional tournament that will be held at Beardsley Gym at 7:30 on Monday night, are the Loyola Ramblers. The Ramblers beat Evanston in Beardsley earlier this season 48-45 in heart-breaking fashion as a furious comeback fell just short for the home team. The Ramblers were also responsible for the Kits’ exit from last year’s playoffs beating ETHS 47-31 in the Regional title game.